Today, whilst visiting a bathroom in the city, I saw this sign on the back of the toilet door. It made me smile. Not because I think anxiety is funny, nothing could be further from how I think, but it made me happy to see it being talked about. Anxiety is not often given the profile it deserves. 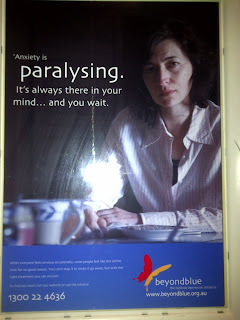 So many people suffer in silence, many not knowing they actually have an anxiety disorder. I know a lady who has lived with anxiety for over fifty years not actually realising she had a problem. She thought that's just how she was. Now she's having treatment she is finally realising that life doesn't have to be lived in a permanent state of anxiousness. The sentence "It's always there in your mind ... and you wait" describes it perfectly. Anxiety is your stalker. Sometimes you never see it hiding in the shadows, other times you catch a glimpse of it following you and then BANG, there it is right in front of you! It was a bit like that for me this past weekend. We went away to Sydney to spend some time with dear friends. We've done this a few times before and every single time the stalker jumps out in front of me. The very first time we visited I had a major panic attack whilst on a sight seeing trip around the Manly area. I literally had to jump out of the car and run into a hospital to find a bathroom. This attack is always in my mind, hiding in the shadows, waiting. For the most part of the last few years anxiety has not been bothering me too much. It just hangs around in the back of my mind, rarely coming to the front. Except when I revisit a place, time or experience when it has previously occurred. Then, out of the shadows it leaps and blocks my path. In the past my anxiety would have paralysed me to the point where every waking thought would be about our trip and how I was going to manage. I would try and micro manage every aspect of the the travel and work myself into such a frenzy that I would have a panic attack just thinking about it. Now, not so much. It is still stressful and I still panic and worry, but not incessantly. I've got a few little tricks up my sleeve that help me cope. Needless to say, I was okay for most of the time, except for the Saturday morning. I woke up tired and unsure of the day's plans - being organised and in control does help significantly. When the plans had been made and we were about to leave I could feel it coming on. That familiar feeling in my stomach and the sweaty palms. I tried breathing deep and thought diversion - no cigar. I went for my big guns - Imodium and half a Valium and within ten minutes I was okay. Now I know this is not the only way to manage anxiety, and it is probably not the way "experts" would recommend. However when I am in the grip of anxiety this works for me. The fact this works will often stop me having an attack in the first place without the need to take anything. Just knowing I can "stop" my anxiety is enough. Sometimes deep breathing is all I need to do and other times just redirecting my thoughts will work. Other times, I need to call in my big guns. That is just how it is. During my fifteen years of dealing with anxiety and panic attacks I have found the key to managing it so it doesn't paralyse me has been finding what works for me. Anxiety is so unique to each person. We all have our own triggers and our anxiety manifests in different ways, which is why something that works for me might not work for someone else. Finding that thing that gives you peace of mind helps to keep the anxiety hiding in the shadows. So far I've not found the holy grail to eliminating it from my life entirely, but for now I can manage. Let's all keep talking about anxiety. Sometimes simply sharing your anxiety with someone else can be enough. Hi Annie, yep, let's keep talking about it, and destigmatise it. Because as you say, so many people have it and suffer in silence. It's also interesting to hear how others cope with it - because sometimes years of therapy just isn't enough. In the past I've used beta blockers with some success, and I also find practicing mindfulness can really help too. Thanks for the great post. Thanks Rachel. I agree. I don't think you can fix anxiety with just one solution. Thank you lovely. That means a lot. Great post Annie. You are a wonderful spokesperson for anxiety. I don't suffer from it but have learned much from your vivid descriptions. Always great to read your thoughts Annie,my anxiety was initially treated with anti depressants which unfortunately made me worse.Then I was prescribed Valium which took the edge off things.I was then given a book called "train your Brain" which was a huge help.I now do deep breathing and exercise to control my anxiety,I find it nearly impossible to feel anxiety when your puffed out after a run.I also think talking about it is healthy.A problem shared is a problem halved.Always good to share views.By the way why am I the only bloke here ? Annie I have become a regular reader of your blog since I read a post you did for Mamamia. I think you're fantastic! Your post resonates with me so much and it certainly makes anxiety a little easier to deal with when you know other people who deal with it and how they deal with it. I've had anxiety for about 15 years and I finally decided I could no longer let anxiety rule my life so I'm finally seeing a professional, which has been really good. I also started taking Lexapro for depression and anxiety and found that it really helps with my anxiety, more than my depression, which was a surprise. I'm definitely a person who bottles these things up but reading your post encouraged me to open up and maybe help another sufferer to know that they're no alone.